Can Art Show How a Porsche Feels, Rather Than Simply How it Looks? James May (of Top Gear fame) recently asked a very similar question in an article published in The Telegraph. He goes on to say, "Love comes in at the eye, according to WB Yeats, but the meaning of a 911 comes through the buttocks and some demons lurking in a dark corner of the mind. Cezanne revealed the world to us through a bowl of apples. Monet did it with the front of a cathedral. Lucian Freud did it with that tubby woman lying on the sofa... Someone must be able to do it with an old Porsche." I think I've found that someone in the form of Automotive Artist Stéphane Dufour* (a new sponsor of PorschePurist). According to Stéphane's bio, he spent most of his childhood contemplating the fine automobile craftsmanship passing through his father's workshop. His father repaired and serviced prestigious cars, authentic masterpieces which stimulated Stéphane's imagination and would deeply influence this young boy's day to day life. While many memorable marques passed through the doors of his father' shop, it's evident, by the sheer volume of work, that Porsche is his strongest passion and most prevalent muse. I asked Stéphane to describe how he decides the autos that are to become the focus of his work, what provides his inspiration? He responded with, "My inspiration comes at any time, for any car. It can be a Porsche 911 or an Aston Martin. It can be a vintage or modern car. Most of time, it is a car that has history (race cars for example). I love the 917. This car is for me a very big source of inspiration." You can see this inspiration first hand in Dufour's work with such notable 917s as Martini 21, the Pink Pig and Martini N°3. Dufour's bio goes on to describe his work as "hyperrealistic". I simply say it's excellent! Apparently, I'm not alone in my assessment as Stéphane sells between 300 and 400 limited editions annually along with more than 250 original pieces. Are you familiar with the saying, "Don't tell me your funny, make me laugh."? Well, I'm not an art critic, so rather than trying to tell you about Stéphane's unique and innovative style that combines synthesizing space, light and shape with movement and color, I would rather you simply see for yourself. The presentation below is but a small sample of Stéphane's work. His limited editions, in runs of 200 to 300 (depending on the piece), are ridiculously affordable, ranging in price from $68.00 to $180 and can be purchased in the US from his California based distributor. For those of you with a bigger artistic appetite, and the budget to match, his original works - those few that are left - are available for sale though Stéphane's web-site. 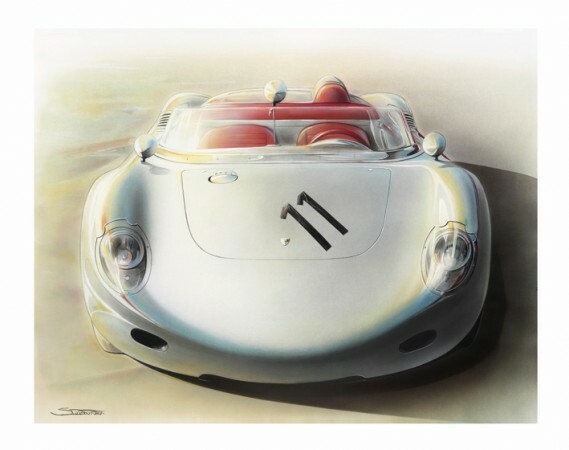 Stéphane is but one of only a handful of artists whose work is officially licensed from Porsche A.G. Besides his original works and limited edition prints, Dufour works on custom commissions by individuals and companies alike. Offering up as evidence of his true love for his craft, Stéphane says it is, "an authentic source of joy for anyone who understands that art and automobiles are two intertwining and intimate domains..."
This is Not Art! It is a Crime!